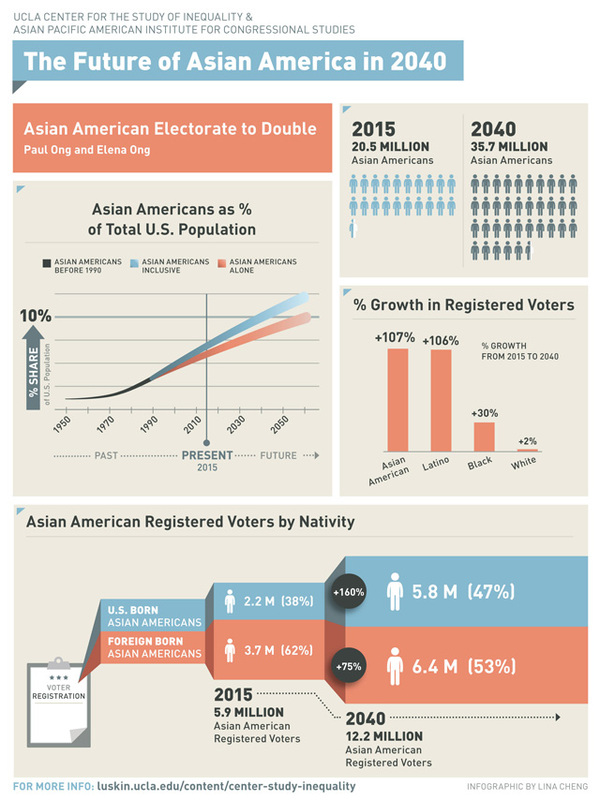 New report projects 12.2 million Asian American registered voters by 2040. A new study, The Future of Asian America in 2040, released today by the UCLA Study for the Center for Inequality and the Asian Pacific American Institute for Congressional Studies (APAICS), projects that the number of Asian American registered voters will double over the next quarter century. The study, the first of a series of reports on the future of Asian Americans and Pacific Islanders, focuses on the growing Asian American electorate, and shows that while the Asian American population will grow by 74% between 2015 and 2040, the Asian American electorate will more than double, and grow by 107%. According to Paul Ong, Director of the UCLA Center on the Study of Inequality, "Our report finds that in 2015, there are 20.5 million Asian Americans, and a quarter of a century from now, 35.7 million. In 2040, nearly 1 in 10 Americans will be Asian American. 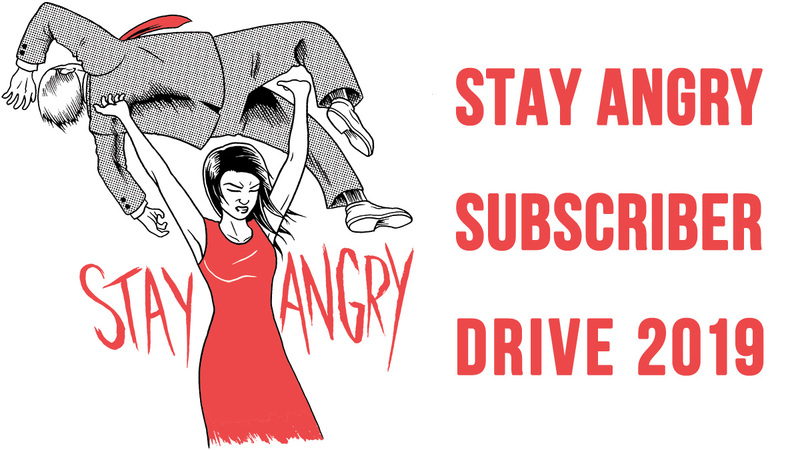 During the same period, the number of Asian American registered voters will increase from 5.9 million to 12.2 million." 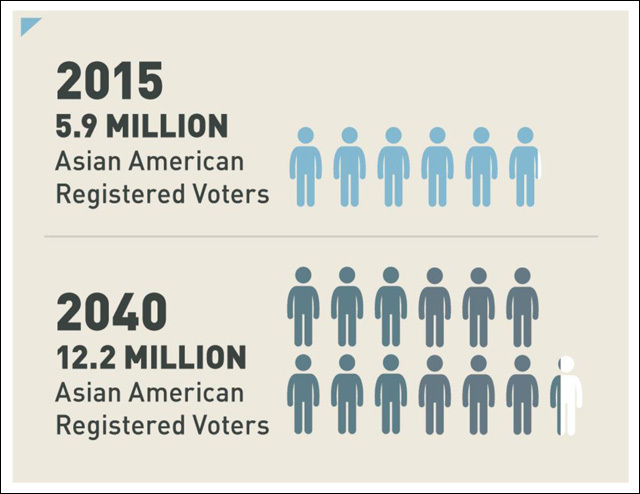 Elena Ong, the report's co-author, says it's important to look at the underlying demographic characteristics of Asian American registered voters. "Today, 62% of the Asian American electorate are naturalized citizens, but over the next quarter of century, there will be a multigenerational transformation," Ong says. "By 2040, 47% will be younger and U.S. born, and 53% will be older and foreign-born." So what does this mean for Asian Americans and Pacific Islanders, as an increasingly influential voter base? 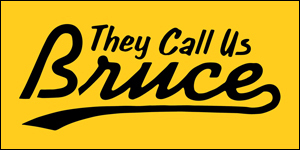 For one thing, it means that candidates, campaigns and political parties need to be responsive to the reality of this shift, or find themselves seriously out of touch with our community, twenty-five years down the line.